*This product is prepaid only. COD and terms are not available on this product. Club flyers may have color fluctuation and imperfections (hickies, scratches etc). Club flyers are a low cost item that undergoes less quality control. If your flyer is color critical or quantity critical you should order our premium postcards and not club flyers. By ordering our club flyer product you are agreeing that color, quantity, trim, bleed, quality, sizing, UV coating and other imperfections are not critical to you. WE WILL NOT EDIT, REPLACE OR UPDATE YOUR ARTWORK ONCE IT IS SUBMITTED, APPROVED AND PAID FOR. These may be things you will not notice but by ordering this product you are accepting these terms and conditions. Club flyers are an excellent and inexpensive tool for promoting special events or concerts at your nightclub. Whether you are promoting a guest deejay or a new club night, club flyer distribution is the fastest and most cost effective way to get the word out about your event. 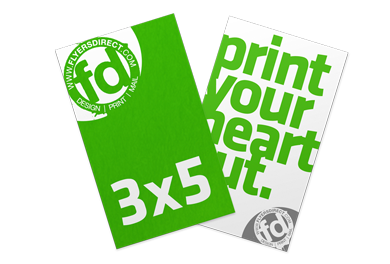 Just like our premium postcards, club flyers are full color two-sided and are printed on 16-point cover stock with UV coating on the front side. The difference is that club flyers are an economy version of our premium postcards. Quarter-page club flyers are the most popular size we offer and the preferred size of the nightclub industry. What makes our quarter-page flyers stand out is the technique we use to coat the front of each flyer with a durable, high gloss UV coating. Unlike flyers that are coated on both sides, the back of our flyers can be written on with a pen.